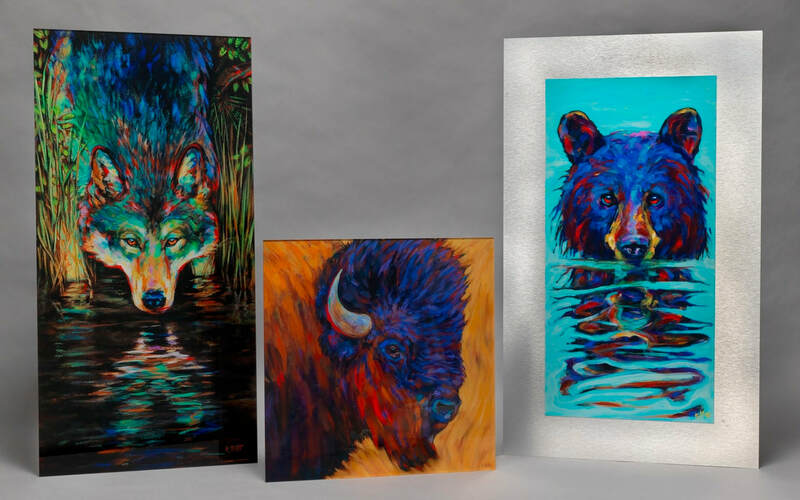 Shown here: 15"x30" acrylic Grey Wolf, 16"x16" acrylic Red Beard, and 18"x30" alupanel Very Wet Bear. After being printed onto a polyester film. The print is adhered to a 4.5mm acrylic panel, which absorbs light and enhances the image in a way that glass cannot- simply stunning! * It is important to note that both the acrylic and Alupanel reproduction processes are labour-intensive and require attention to detail by real people in every step of the process. They are not "machine-made" products. For alupanel reproductions, they also begin by printed onto a polyester film. The print is then coated with a 10mm high gloss laminate before it is adhered to the Alupanel. The result is a clean, sophisticated look. ​ALUPANEL® aluminium composite sheet consists of a polyethylene core sandwiched between two 0.3mm aluminium skins. With all the benefits of aluminium composite, ALUPANEL® combines durability with flexibility. This formable and dual-sided sheet has one satin finish surface and the other in 75% gloss. A micro fibre cloth used gently on the surface of both Acrylic and Alupanel will remove most fingerprints. If more cleaning is necessary, please use water and a mild dish soap; glass cleaners may scratch the surface of your reproduction.